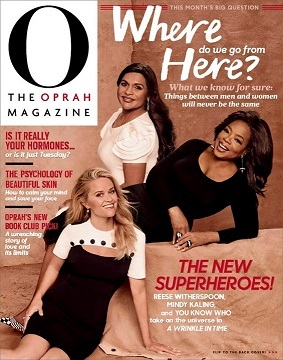 Published by Oprah Winfrey, renowned host of the Oprah Winfrey Show, geared towards women. It helps women better their lives through growth and discovery. Publishes advice, self empowerment tools and general information about anything from health and fitness to dealing with domestic violence. Every issue features recipes for those trying to eat healthy, fashion and beauty advice for those trying to keep up with fashion trends, as well as book reviews on recently published books.